Photo scanned from a scrapbook held in IWU archives. The person is unidentified but the book includes named graduates from classes in the years after 1890. 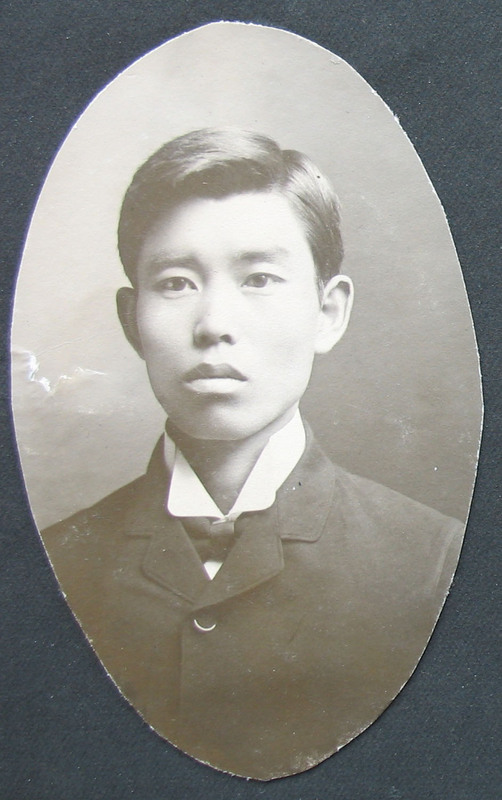 In 1890, Wesleyan’s first two international students graduated from IWU’s Law School. Their names were Yeizo Osawa and Kashiyira Tanaka. They were from Tokyo, Japan, and were in residence on campus when they graduated. Stories in our student publications relate how they shared their culture with IWU’s campus, such as delivering lectures and describing some of the customs of Japan. Their presence among the graduation class of 1890 was even noted in local newspapers and in the Chicago Tribune. Sounds a lot like what online learning programs promise today, doesn’t it? An early graduate of the program with an international address is Rev. John Oakly Spencer of Japan, who graduated with a Ph.B in 1888. One wonders about the possibility of Osawa and Tanaka meeting Oakly and finding out about our small school in Central Illinois! Other Non-resident graduates living abroad in the same time period were Rev. Myron Chesterfield Wilcox of China who also graduated with a Ph.B in 1886, and William Groves of Uruguay who graduated with an M.A. in 1897. William C. Armstrong and Frederick W. A.Meyer, of Ontario, Canada and Arthur Thomas Carr of Birmingham England all received M.A. in 1896. These men were not international students in the same way we think of today, but they demonstrate our current philosophy has long-standing roots: bring the world to Wesleyan and Wesleyan to the world! To learn more you can visit Tate Archives and Special Collections in the Ames Library or contact us at archives@iwu.edu! This entry was posted in Alumni, Campus units, Cultural Studies, Departmental histories, Research files and tagged Archives, classes, digital newspapers, diversity, newspapers, primary sources, Records by Meg Miner. Bookmark the permalink.